From both sides now… | Damian Trasler's Secret Blog - Do Not Read! ← More new releases from Lazy Bee Scripts! Some recent discussion of New versus Original Trek on G+ brought this song to mind. Does JJ Abrams really “get” Trek, or is he just taking characters who had some depth and originality and running them through the wringer of the modern, effects-laden action movie? That’s not the question this post is going to look at, because I thought about it and then thought about how I loved watching the new movie. On one side I have some hard-core Trek friends who decry the many fallacies and inaccuracies in the movie (see this FAQ for some of the better points), but on the other side – maybe on the INSIDE – I am still a kid who loves zippy spaceships, phaser battles and action and adventure in space. This isn’t the first time I’ve fought this particular battle with myself. I’m a big Star Wars fan. Big. For example, most of you out there will know that Han Solo’s* ship is called the Millennium Falcon. Well done. But did you know it was a YT1300? That’s me. 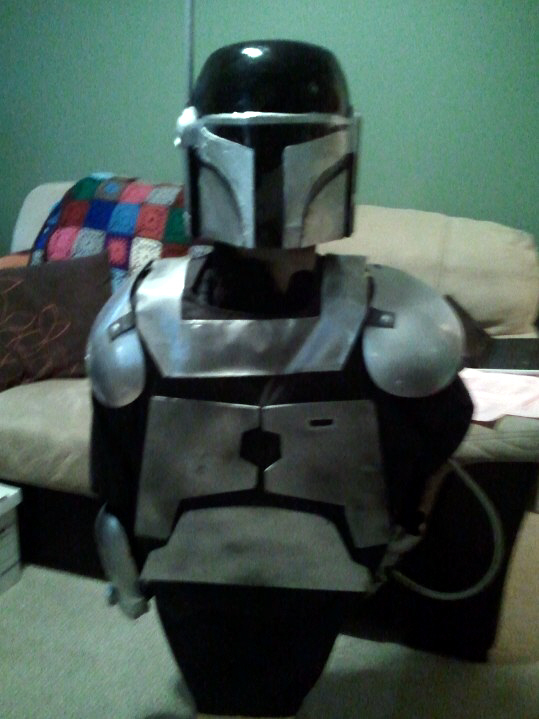 I have a suit of Mandalorian armour in my workroom. I made this. And I’m remaking it. Sometimes, yes, I wear it. So, if anyone was going to react with horror to the new trilogy that George Lucas produced, it would be me, right? So steeped in the lore of the Star Wars universe that I simply wouldn’t be able to bear the mish-mash of ideas and storylines that got run through the mill. Actually, my reaction to “The Phantom Menace” was about the same as to “Star Trek Into Darkness”. I could see all the objections. Yes, Jar Jar is annoying. Yes, the whole Midichlorians things was out of left field. No, it doesn’t take a Jedi master to spot that Ian McDiarmid was up to SOMETHING… But there were new worlds, new droids, and fighting with double-bladed lightsabres! When I was a lot younger, we used to watch tv together as a family. We watched all kinds of shows that aren’t around any more: “It ain’t ‘arf hot, Mum”, “The Good Life”, “Some mothers do ‘ave ’em”, “The Goodies”, “The Sweeney”, “Starsky and Hutch”. I sat there and watched these shows every week, and you know what? I couldn’t tell you a thing about any of them. I mean, I might be able to remember some character names, but the actual plot lines? Not a clue. Because I was watching at an age when the spectacle was the important thing, the immediacy. I laughed at the jokes, was excited by the chases, worried about the heart-stopping danger, then let it all drift away afterwards. Looking at the internet rage over Star Trek, the people sharpening their knives ready for Disney releasing Star Wars Episode 7, I find myself longing for that ability. I love the originals in both cases, and I’m going to carry on watching the new versions because they are new. I’ll continue to divide myself in two, seeing both sides of the arguments, if that’s ok with everyone. *Anyone who thought his name was Hans Solo, please stop reading. FOREVER. This entry was posted in Uncategorized and tagged internet rage, JJ ABrams, Mandalorian Armour, Phantom Menace, Star Trek, Star Wars, trekkie. Bookmark the permalink.